March 27, 2019 -- The smart utilities sector is growing rapidly as companies encounter increasing security regulations, a need to automate readings, eliminate estimated billing and remotely confirm service status. Connected smart meters can help solve these challenges and more. For example, a smart meter’s software can be updated over-the-air to proactively mitigate security vulnerabilities. However, utilities often face challenges in scaling their IoT deployments due to the diversity of device types, broad range of connectivity protocols and security concerns. Utility solution providers must support upgraded security protocols in the next generation of smart meters and AMI, as well as enable secure updates throughout the solutions' lifecycle. In addition, utilities are often looking for secure, easy to deploy, end-to-end solutions to get connected meters into the field, rather than having to implement and maintain several disjointed solutions. 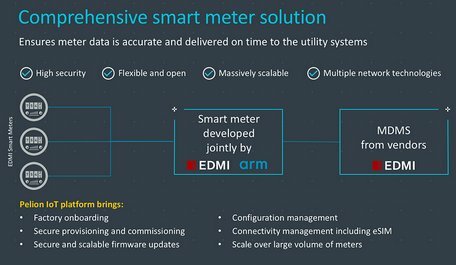 Arm is partnering with EDMI to simplify and speed up the secure deployment of connected smart meters and AMI solutions. EDMI is integrating the Pelion IoT platform and Mbed OS (PSA Certified) with its existing best of breed smart metering solutions to further expand beyond their millions of endpoints already deployed globally. A utility can use this next-generation IoT solution to seamlessly develop, deploy, connect and manage millions of smart meters and increase the volume and frequency of data collection to quickly localize and address an outage, detect power theft, track usage patterns to better plan asset upgrades and maintenance, and more. Pelion Device Management and Pelion Connectivity Management provide the secure foundation that enables utilities and AMI vendors to securely connect and manage the broad range of IoT devices including electric, gas and water meters. This includes secure over-the-air software updates throughout the device lifecycle, optimized support across connectivity protocols (such as NB-IoT, cellular, Wi-SUN, and more) through a single contract, and the ability to leverage a hybrid cloud architecture that provides the flexibility of running the AMI on-premise or in the cloud. The ability to manage devices on-premise is particularly important for smart meters, as these are part of the energy grid, a mission critical service that needs to reside at the utility company’s datacenter. In addition, Pelion Device Management Edge provides the gateway management technology that enables utilities to aggregate data for AI and analytics at the edge. Interested in learning more about how you can quickly and securely deploy, connect and manage IoT devices through the Pelion IoT platform? Come visit our booth at Hannover Messe (Hall 6, Stand B42) on April 1-5 to discuss further.